As we broke up for the Summer holiday, staff began moving furniture and equipment into our new Centenary Building. Excellent progress has continued throughout this term and there are just a few 'snags' left for Morgan-Sindall to complete. We would like to thank the whole building team for the work they have undertaken to deliver such an amazing new facility. Our Key Stage 3 students and their teachers will begin using the building in the forthcoming Autumn term. 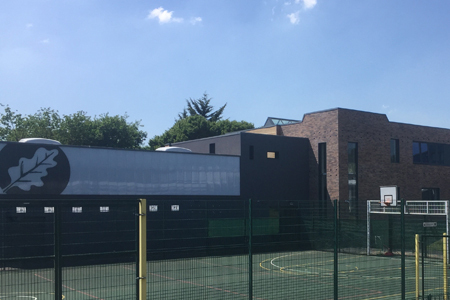 The 8 spacious new classrooms, therapy room, meeting spaces and PE hall enable Oak Lodge to expand to 190 pupils from September 2017, in a separate development from our proposal for The Windmill School. Oak Lodge first opened in 1916 on a site at Oak Lane before moving to Heath View in the 1970s. This new Centenary Building is a fitting opportunity to celebrate more than 100 years of special education service!